33 years and counting, our experience becomes a true difference here! With our innovative steam cleaning technology and bio-degradable solutions and polishes, your boats retain their sheen for long. By using steam, we ensure that boats are cleaned with as less water as possible and don't need to be scrubbed for grime removal, one practice that frays the exteriors badly! Our eco cleaning method restores boats to prime condition, whether for resale, leisure or showcases. There is no easy or quick way to restore a boat. Many highly skilled boat detailing professionals must work for long hours manually to get you the results. And that's what our professionals love doing! Our technicians have many years of boat detailing experience. Their experience combined with our innovations ensures that while paying for boat detailing you not only get back a boat that looks in great shape but you add a few dollars to its resale value as well. We restore boats to mint condition with our marine detailing service. Wherever your boat floats, Speed Clean will be at your service! Speed Clean Services boat specialists prioritize customer convenience so we perform in our state of the art auto detail shop or onsite by mobile detailing units If your craft is too large to tow. Just choose a time and place that best suits you and get your boats back in prime condition in your own well. Prices vary depending on type of service, location and condition of the vessel. Call for a free quote today. Steam cleaning interior - Interior cleaning is equally sufficient and thorough. Storage lockers and hatches where mold and mildew usually start are steamed clean to precision. Our experts annihilate scuff marks, bird stains, and rust on every slip and turn. The helm stations including instrument panels, throttles, wheel, cushions, and exterior chairs are inspected and restored to neat and grime-free condition. Steam cleaning exterior - Exterior cleaning involves removal of any dirt, grime, and impurities that may have built up on the boat. 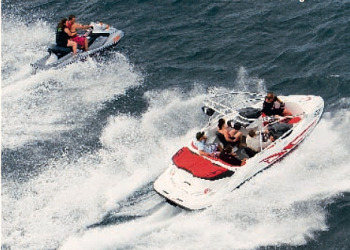 Special attention is provided in detailed areas of your boat such as the rails, rod holders and wood trim. 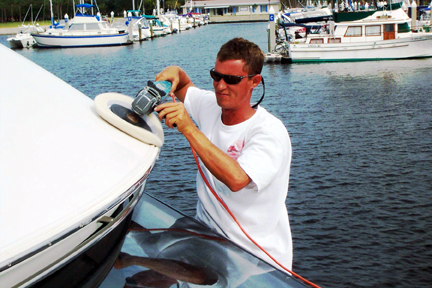 Our experts are keen on keeping the bright work of your boats polished and clean. Wet sanding is applied on the hull to avoid scraping and fresh coat of clear coat wax seals the deal. Hull and topsides exterior boat detailing is offered separately.